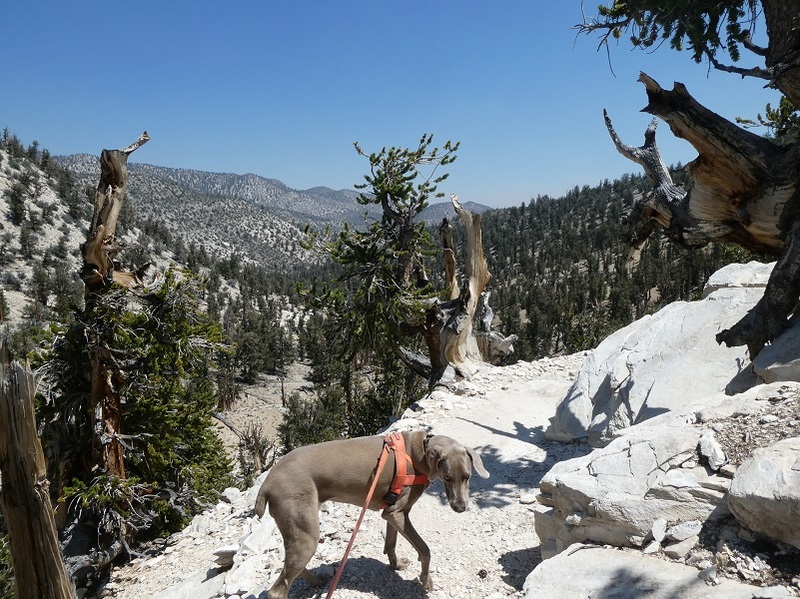 Sally and I had escaped the Ferguson Fire smoke by heading over to the east side of the Sierra. 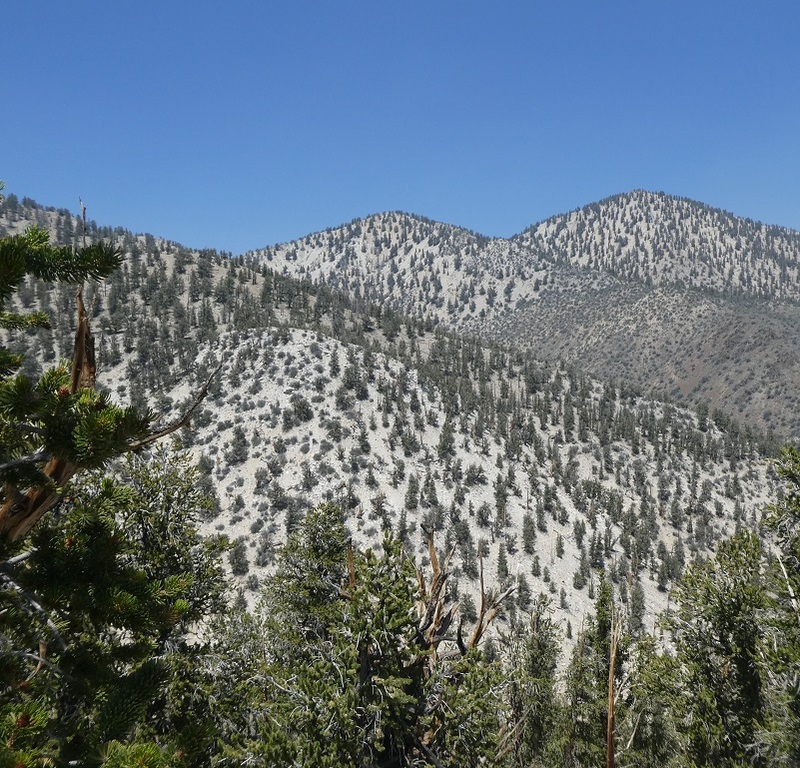 We spent the night in Lone Pine, then headed up Hwy 395 to the White Mountains. 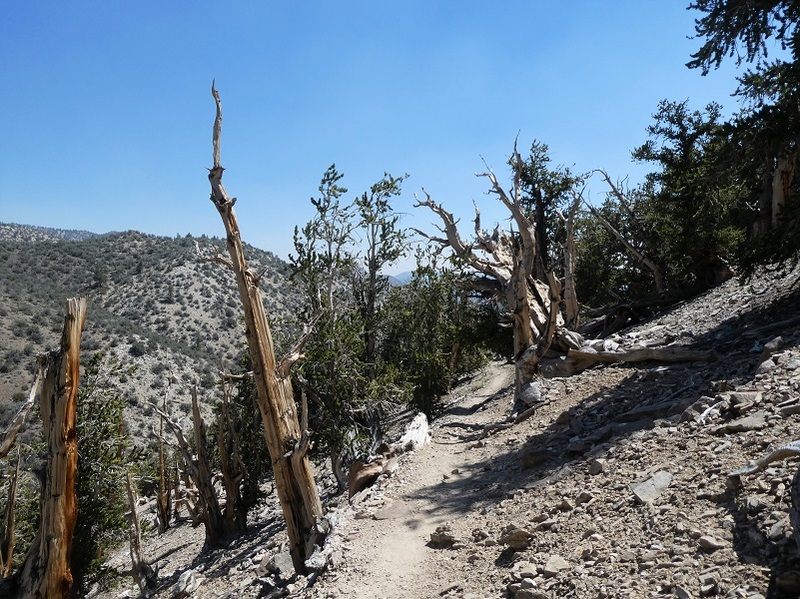 I hoped that by getting up over 10,000′ elevation, we would experience smoke-free air plus I had never been to ancient Bristlecone Pine Forest and wanted to check it out. 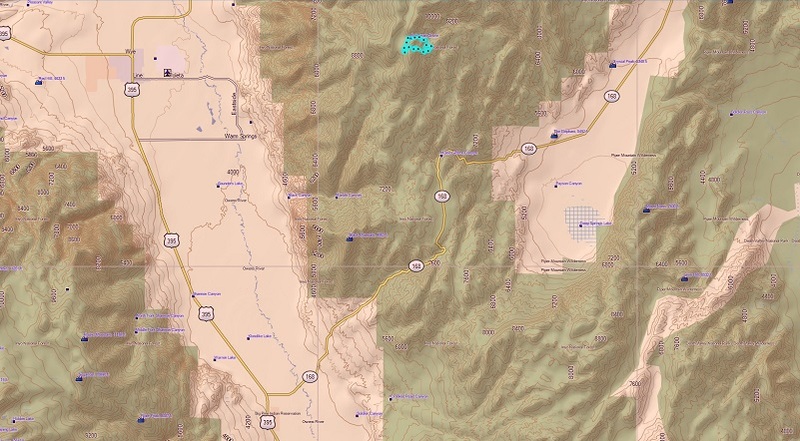 You can hike with me on the 3D Doarama link at the end of this blog in the Map section where you can zoom in or out and tilt the Doarama to get an amazing view of the country. 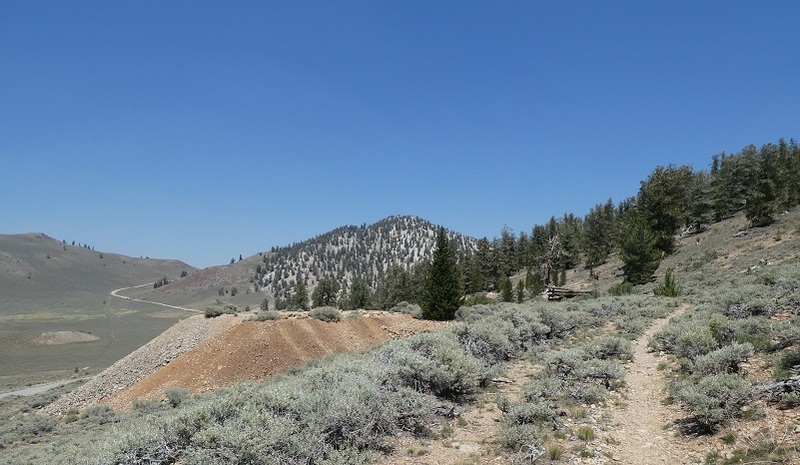 From Highway 395 just north of Big Pine, we drove east on CA 168 for 13 miles. 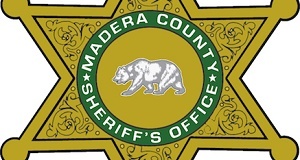 There is a section of the road that is about 600 feet long and only one lane that goes through a narrow cut. If two cars are there at the same time, there could be a bit of a surprise and to top that off that part has a curve on it so you can’t really see what is headed your way so I slowed way down. I lucked out and didn’t meet anyone. 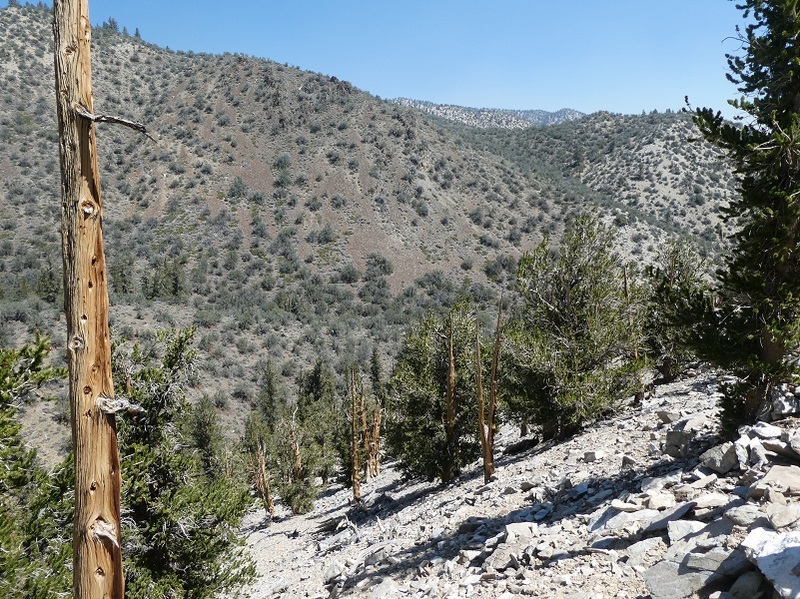 I turned left (north) on White Mountain Road to the Bristlecone Pine Forest and up the very curvy and steep paved road. I drove up 5 miles to Grandview Campground and grabbed a campsite. I sure didn’t want to take a chance at not having one and who knew, I bet there were many folks with the same idea that I had of trying to get out of the smoke and this was a great spot to do that. 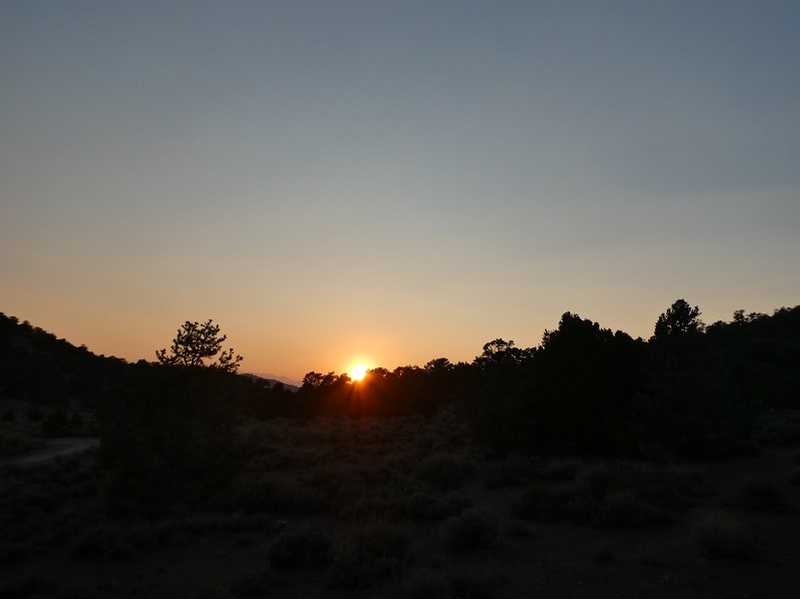 After setting up camp, I drove 5 more miles up to the Ancient Bristlecone Pine Forest Visitor Center Parking Lot. For the total 10 mile drive, I gained 6,000 feet in elevation on a winding road. 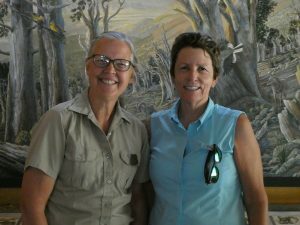 I met up with a wonderful and friendly volunteer at the Visitor Center named Mary Matlick. She invited Sally to come on in but I left her tied to a picnic bench outside. I shared with her that I would like to hike and see some of those ancient bristlecone pines, so she handed me some information, along with a map of 3 different hikes that start by the Visitor Center. They all sounded interesting but I chose to do the longer one and the one with the really old tree named Methuselah on it. The Methuselah Tree was 4,789 years old when it was sampled in about 1957. That means that it germinated in about 2833 BC. WOW!! 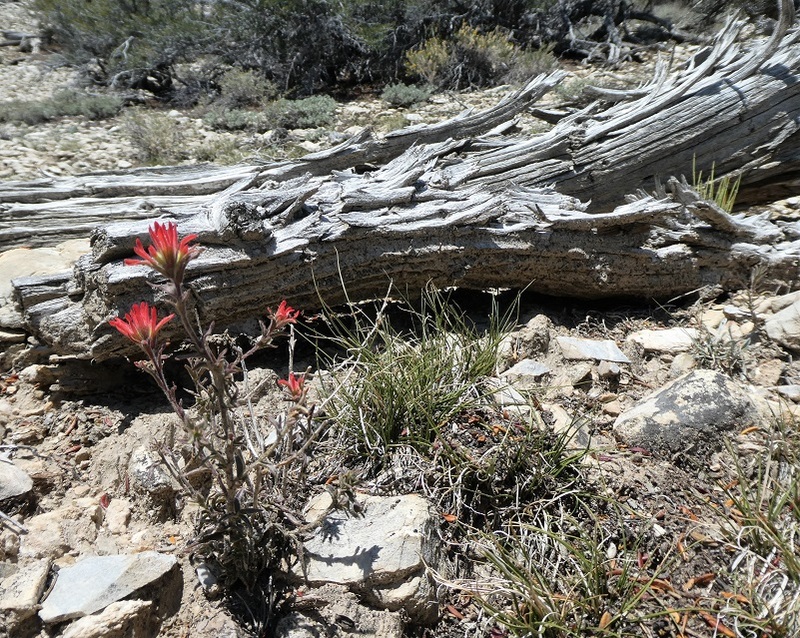 For many years it was thought to be the world’s oldest known living non-clonal organism, until it was superseded in 2012 by the discovery of another bristlecone pine in the same area with an age of 5,067 years, germinated in 3050 BC. 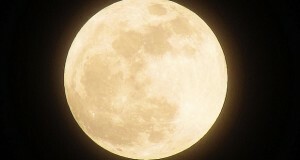 WOW Again! 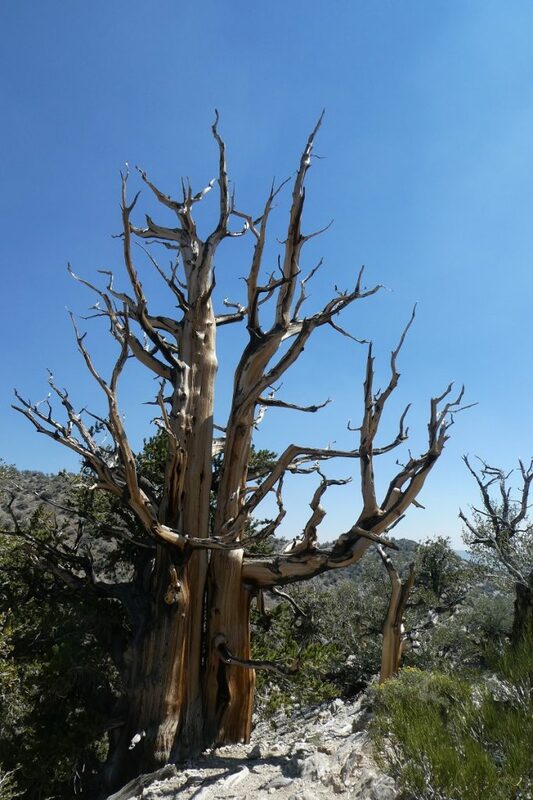 Mary shared with me that they won’t tell people just which tree is the Methuselah Tree in order to protect it but that I would walk by it. 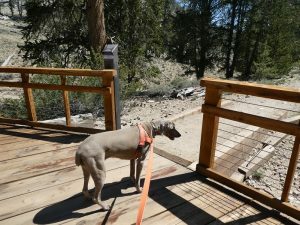 I had read that dogs were welcome on the trails on leash but confirmed with her that is true. 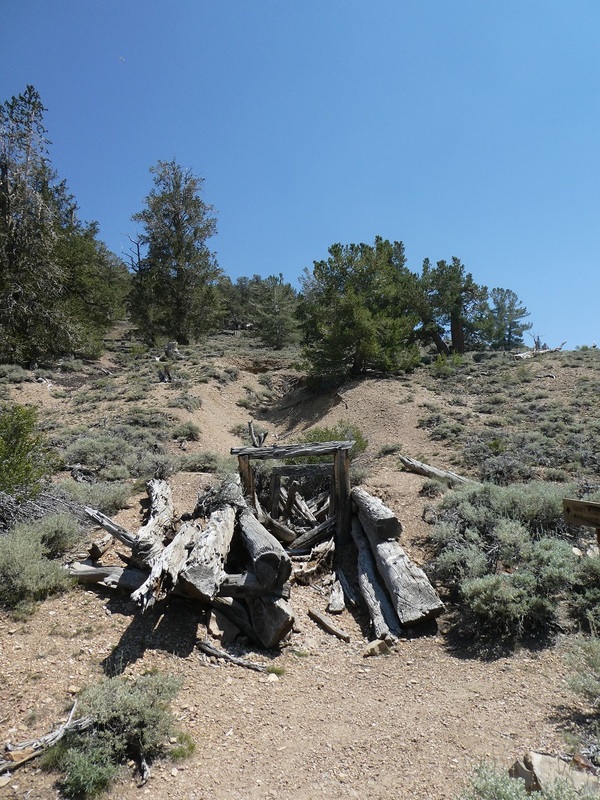 I also had heard that there is no water at the Visitor Center or on these trails and that was true also and you know what that meant . . . I needed to pack Sally’s water with us. 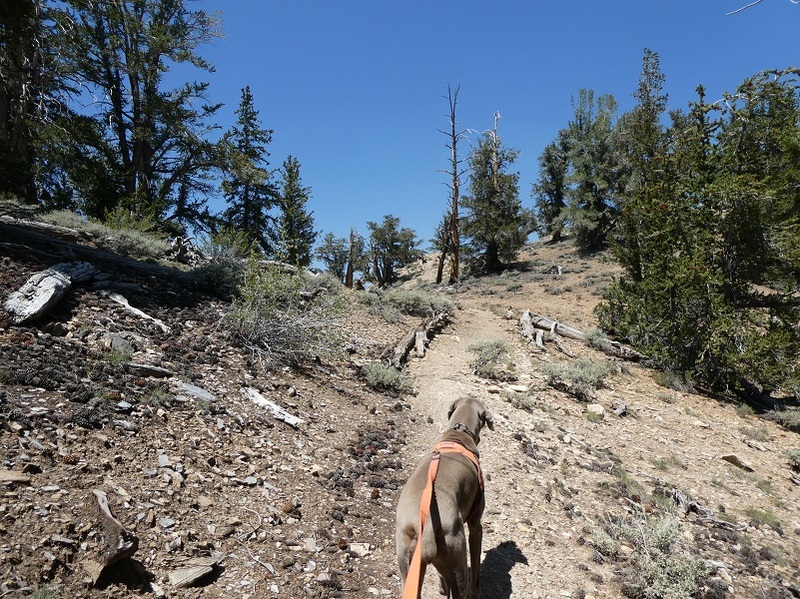 Sally and I started out on the Methuselah Trail, 4.5 miles with a 800 foot elevation gain. 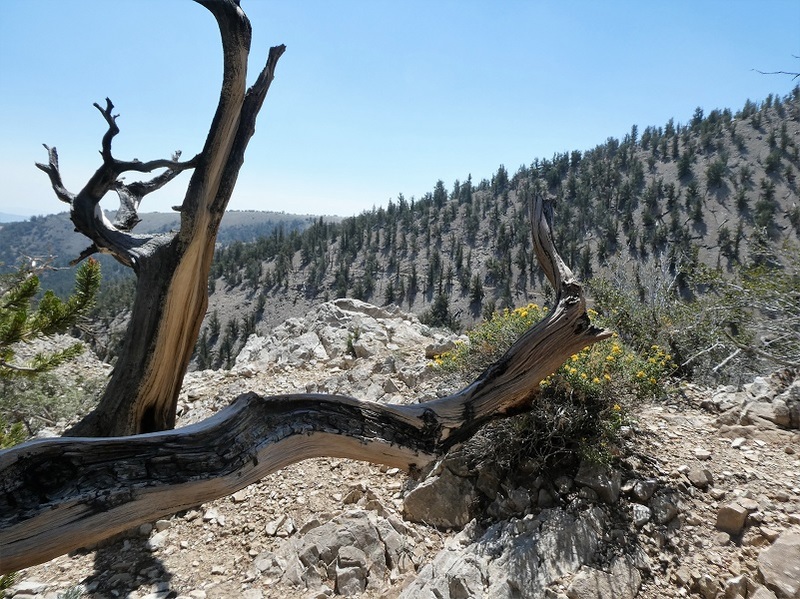 Mary had told me that the environment that these trees were living is very fragile and keeping on the trail is very important for their continued health. So that is exactly what Sally and I did. 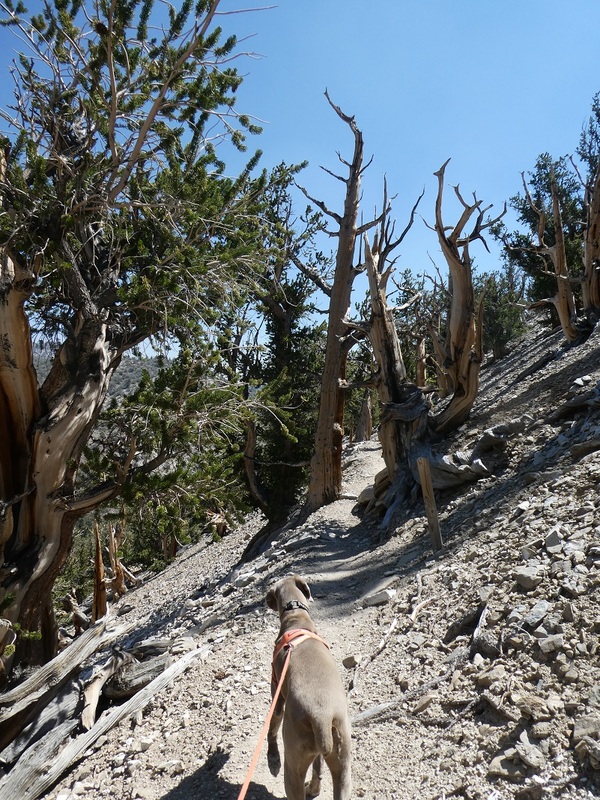 The trail led us right by beautiful old bristlecone pine trees. 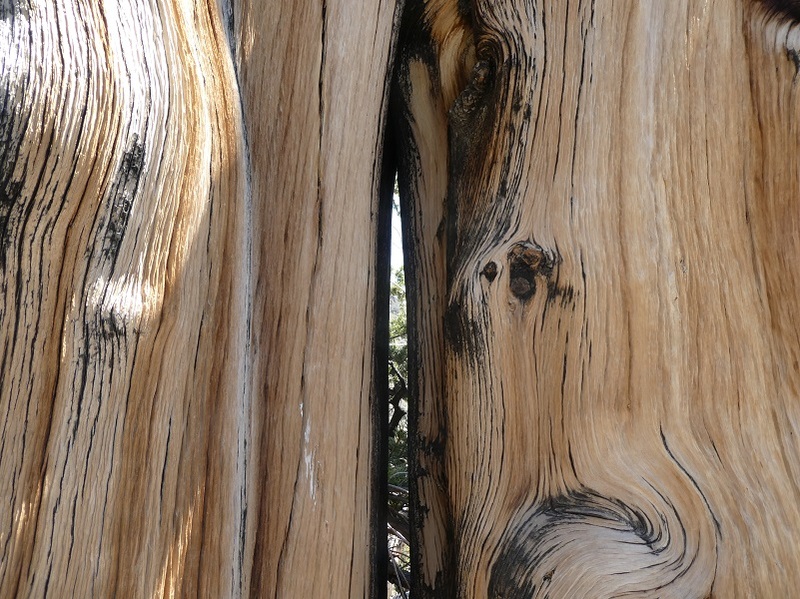 I felt like I should ask permission from this tree to take closer pictures of its bark. 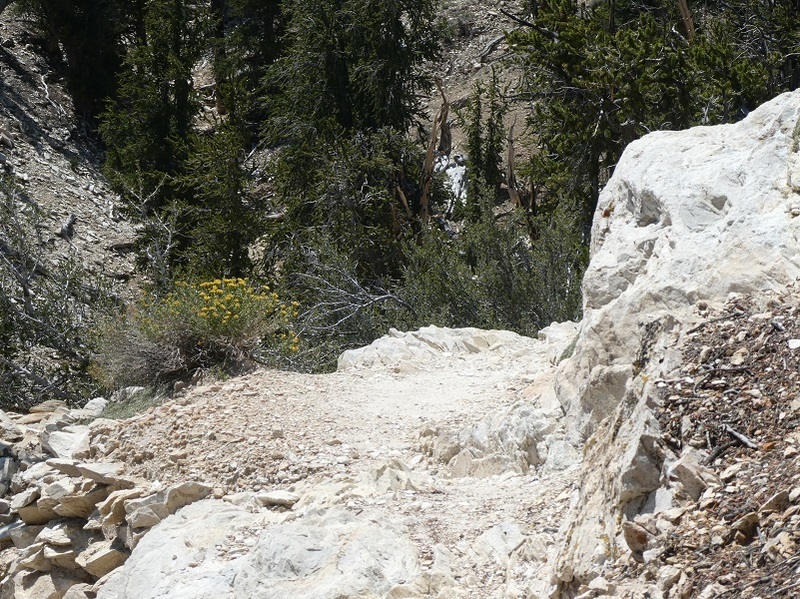 I could see where the trail was going to lead us so we continued on. 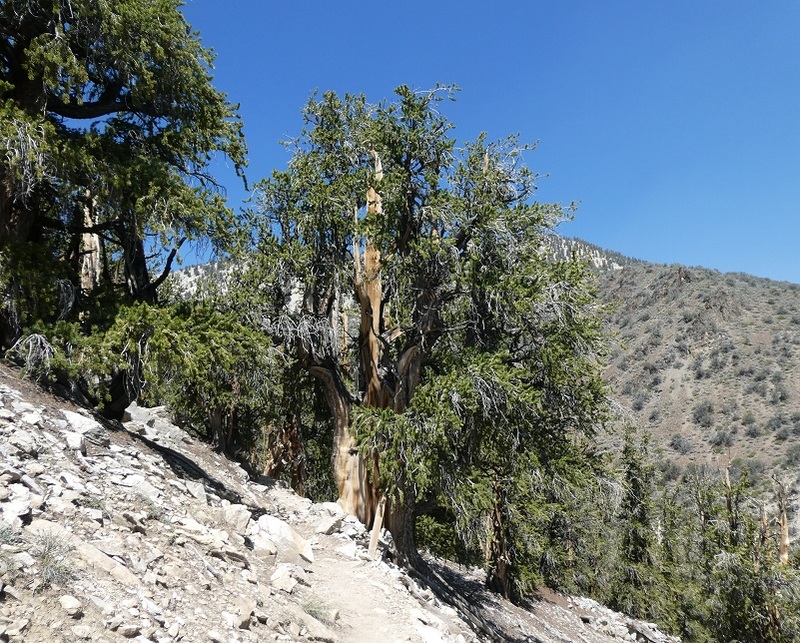 Sally led the way through the bristlecone Pines, but also through other trees such as pinyon pine, mountain mahogany and limber pines. There were several nice benches to take a break on. 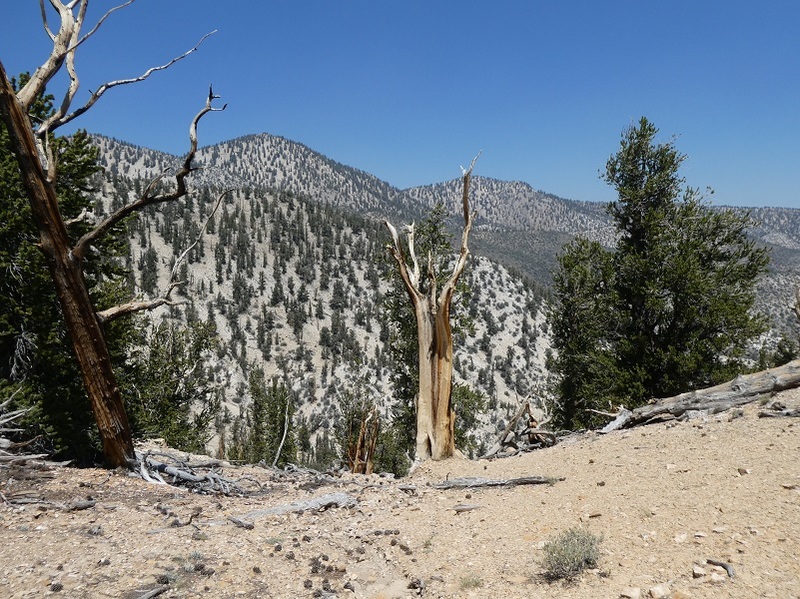 As I walked on the trail and had my eye on the distant trees and trail, it looked very dry. A closer look revealed colorful flowers blooming along the trail and under some of the trees. The soil took on a white color in places. I learned that this is dolomite, a very alkaline limestone. 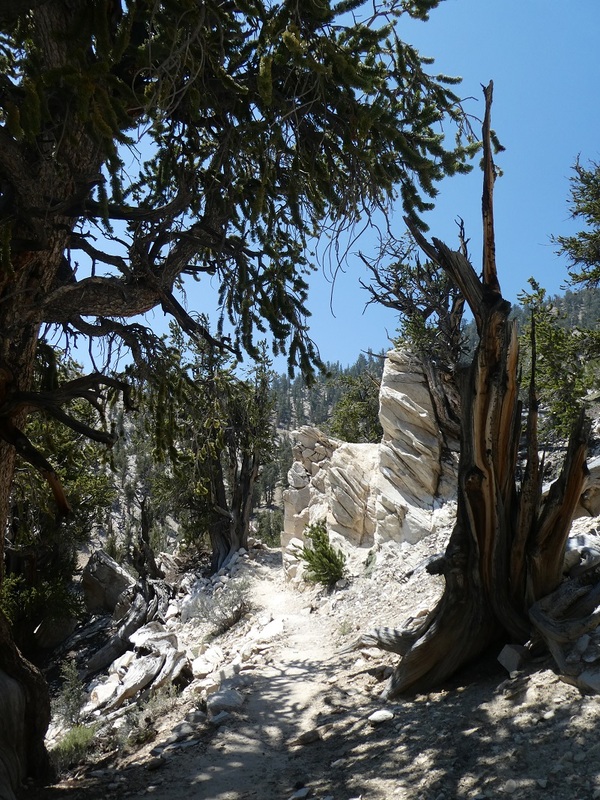 The bristlecone pines have adapted to be able to grow and thrive in these soils. 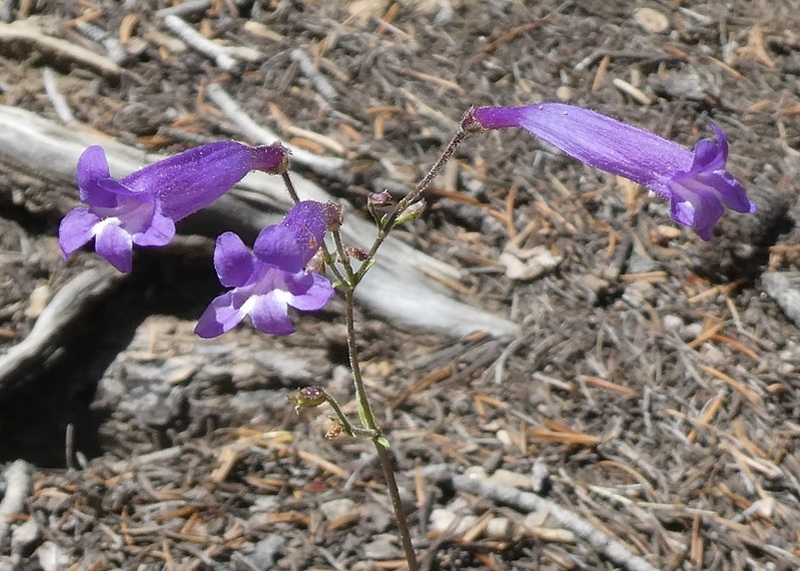 Most other plant species cannot. There were some pretty dramatic views along the trail. 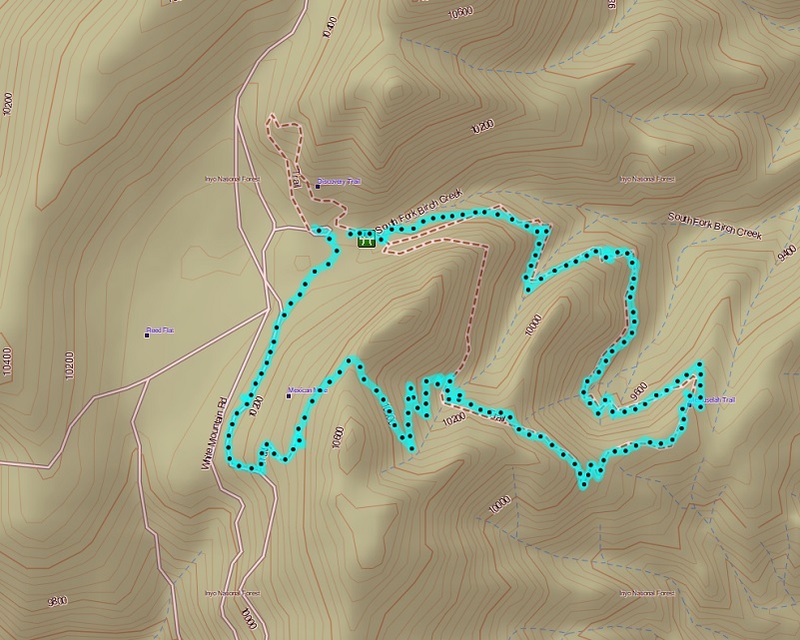 The trail swung around the hill and was on a southern exposure for a while. 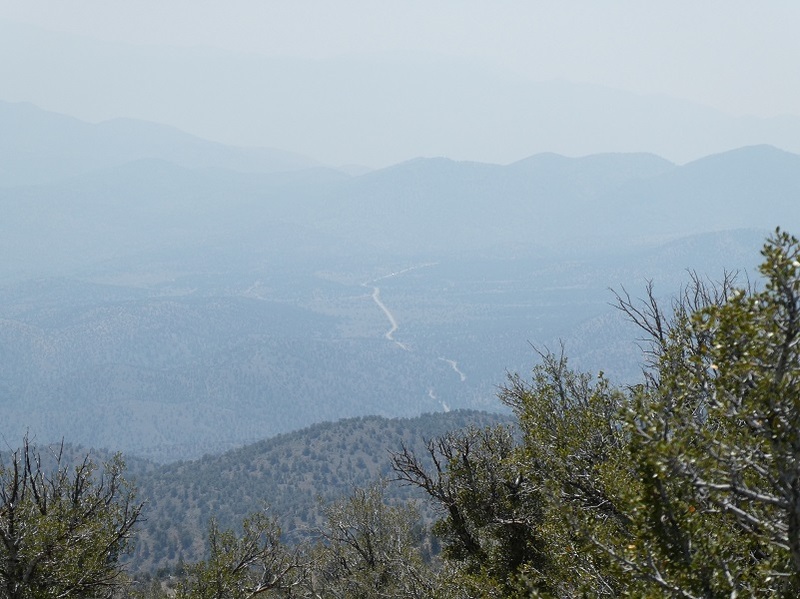 And there were some pretty not so happy views to the south, looking toward Death Valley and the road that I had driven up. Yes, that is smoke out there. 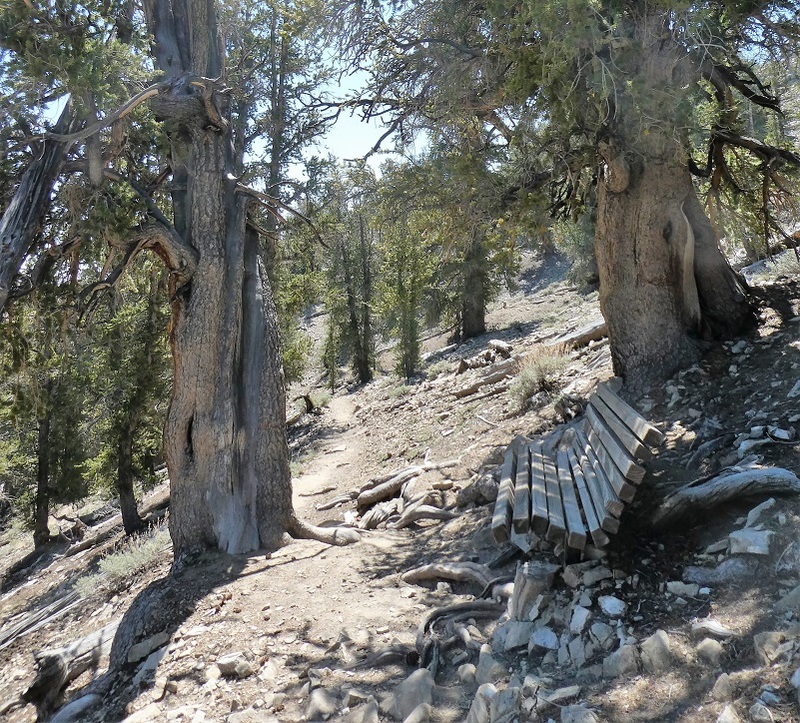 Sally and I saw a sign that showed us how to cut over to the Bristlecone Cabin Trail. 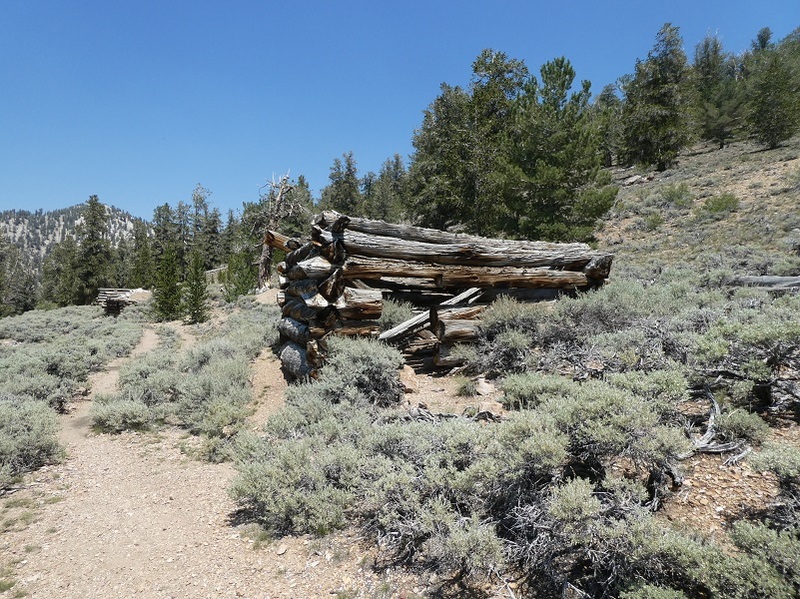 I had kind of been thinking of doing the 3.5 mile looped trail from the Visitor Center when we completed the Methuselah Trail. 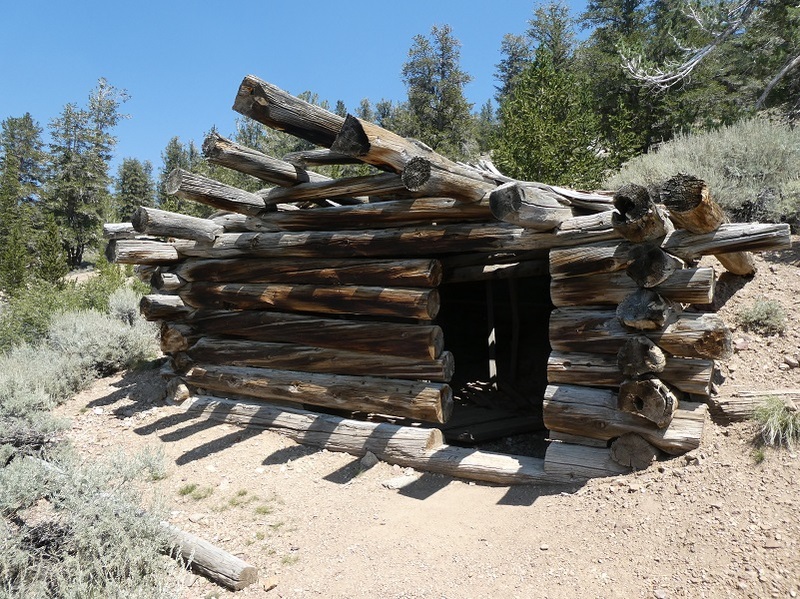 If I would have looked closer at the map before I left, I would have seen that they tied in but it was a nice surprise to discover that I could do a bonus stretch and see the mines and cabins. 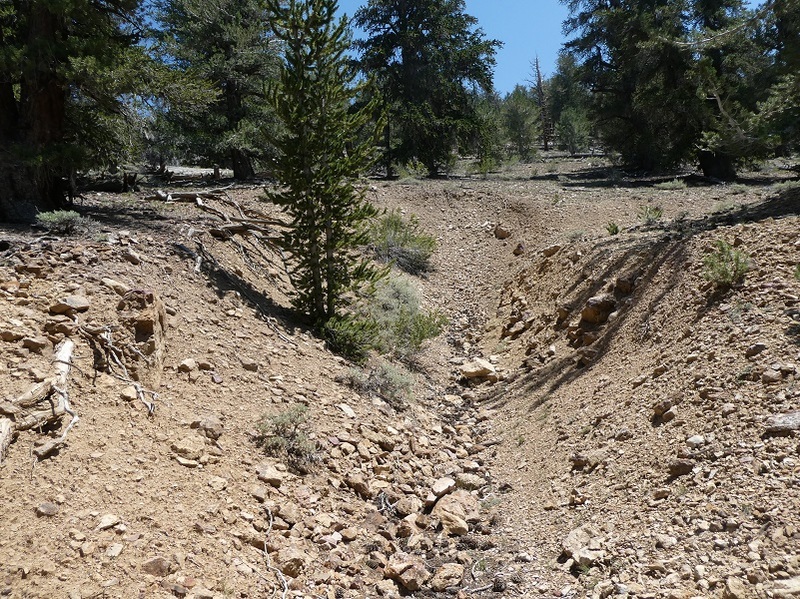 The connecting trail that we followed was actually an old mining road. 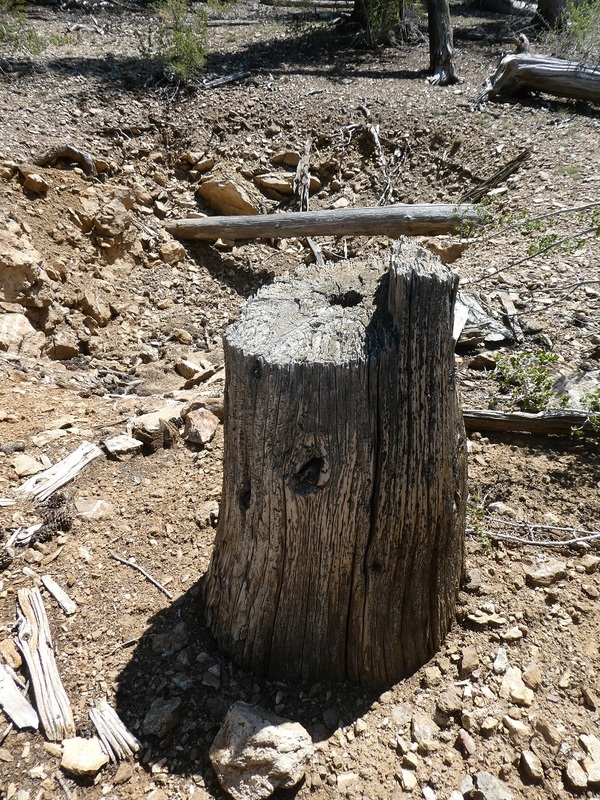 As soon as we topped through the saddle, we started to see old diggings. 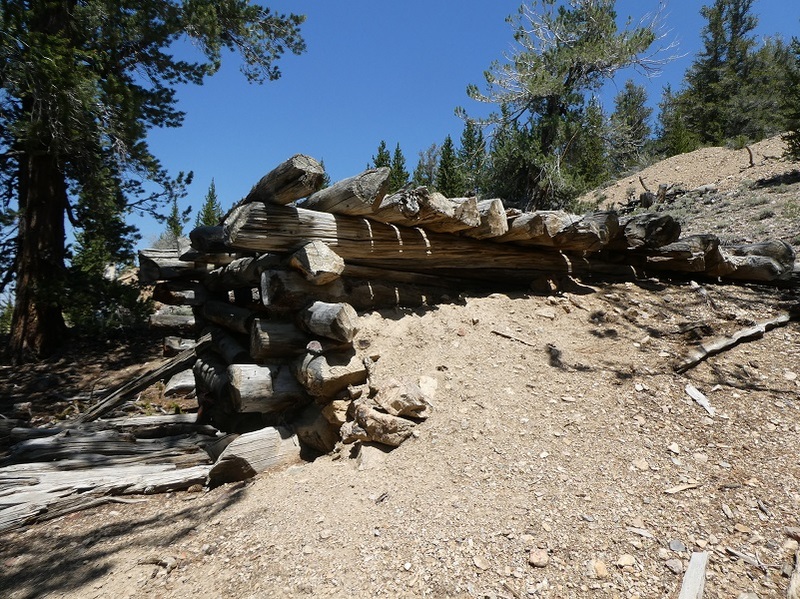 These diggings were from the old Reed Flat Mine, discovered in 1862, but modern production didn’t start until 1909. 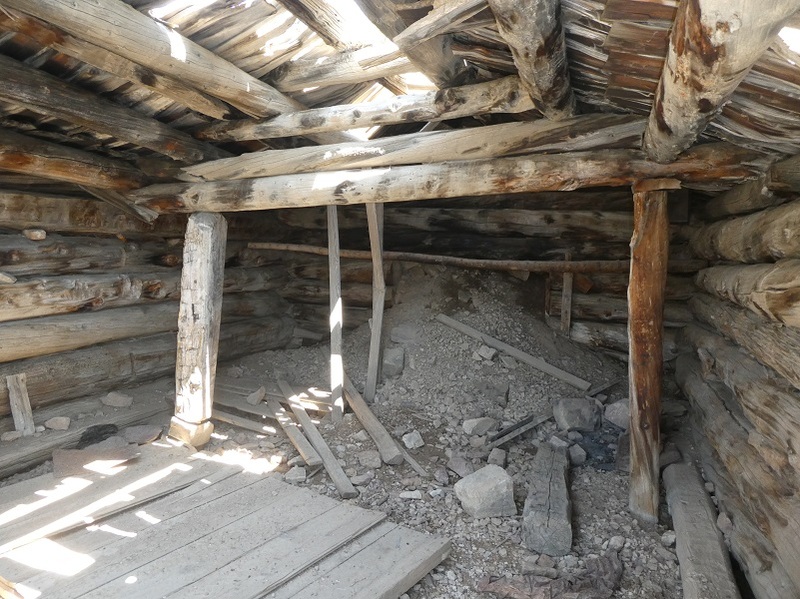 Western Mining History says that it was primarily a silver mine and secondarily mined lead. 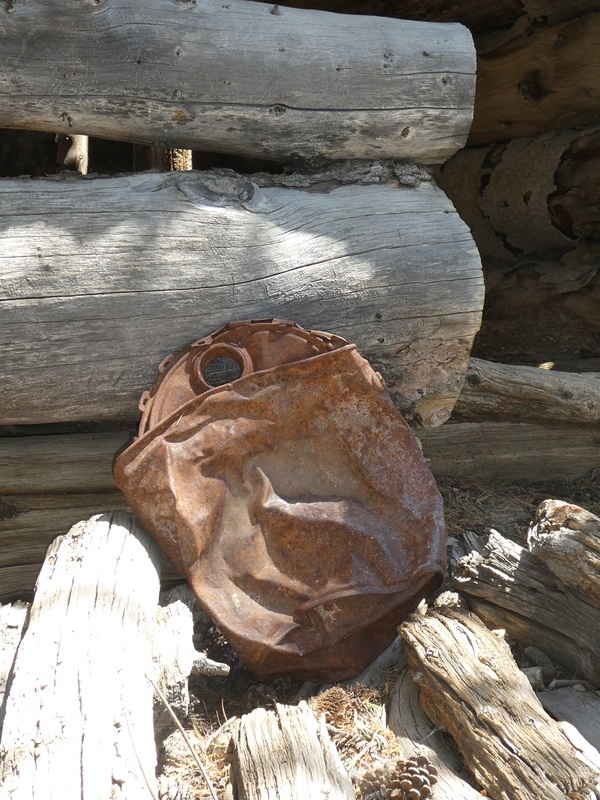 It changed hands through the years, later called the Birch Creek Rare Ii Area and finally the Mexican Mine. It actually did produce some silver. Data shares that in 1909, it produced 1 Ton; 1,090 Lbs lead, 62 Oz silver, 19 Oz gold 10 Tons and in 1910 it produced From 10 Ton; 39.57 Oz silver and 15 Oz gold 10 Tons. I know these figures are a bit confusing and the old report showed the amount like this as yield per 10 Tons. The mining stopped in the 1950’s. From Minedat.org, the workings included surface and underground openings. 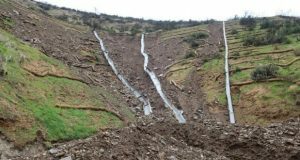 There are several open cuts, a 60 foot shaft with an 800 feet crosscut adit driven S60E. There are also over 400 feet of drifts and crosscuts driven N from the adit. A 60 foot winze and a 25 foot raise are also present. An adit (from Latin aditus), entrance is an entrance to an underground mine which is horizontal or nearly horizontal, by which the mine can be entered, drained of water, ventilated, and minerals extracted at the lowest convenient level. Adits are also used to explore for mineral veins. Here is a bonus item for you. What is a winze? From Wikipedia: A winze is a minor connection between different levels in a mine. When worked upwards from a lower level it is usually called a raise; when sunk downward from a higher level it may be called a sump. 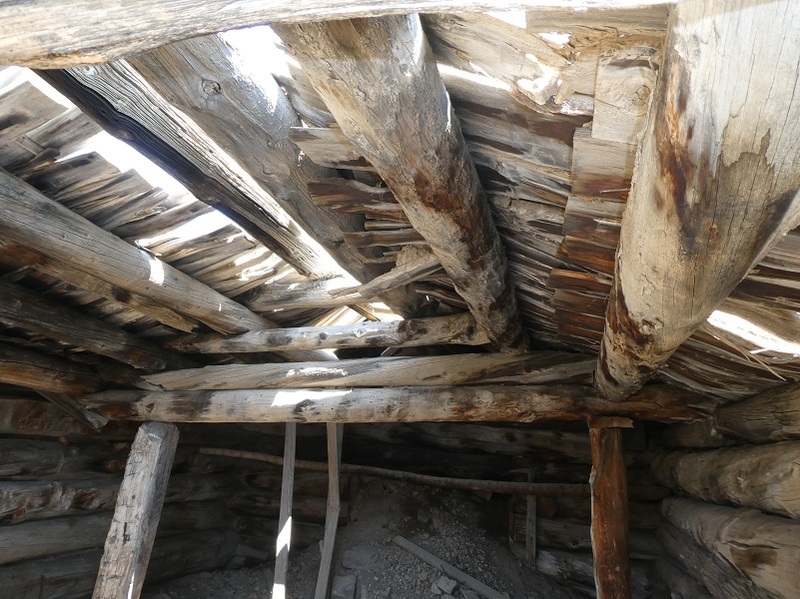 The top of a winze is located underground and it is not equipped with winding gear, in contrast to a shaft, which is a deeper connection between levels and does have winding gear, whether the top of the excavation is located on the surface or underground. 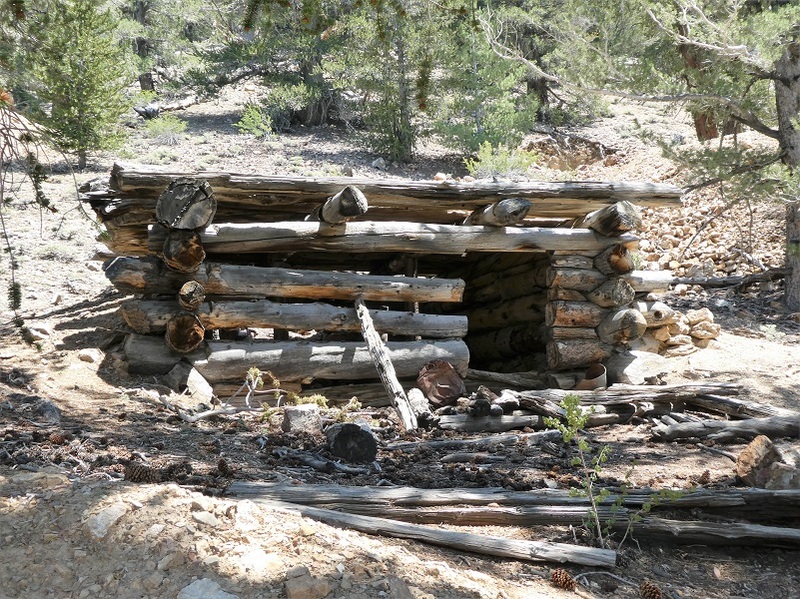 We came upon an old cabin. 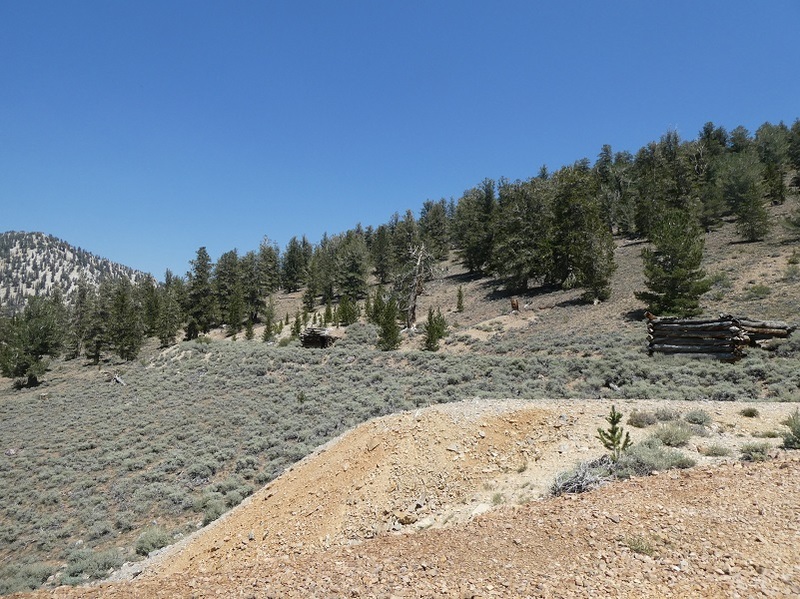 We continued on that old mining road that led us back toward the direction of the Visitor Center. 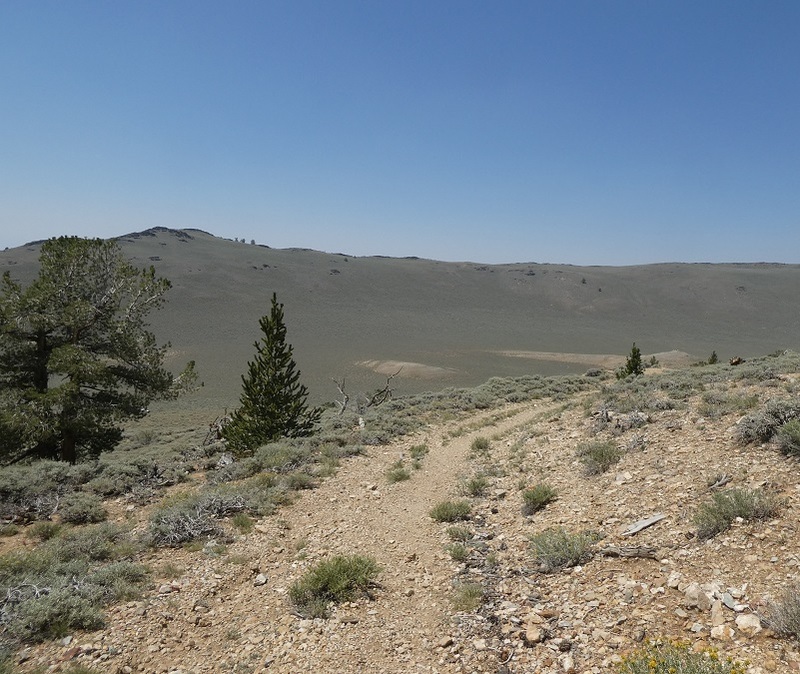 I could just imagine wagons, horses and the people that traveled that old road. And it wasn’t long before we could see the landing where they hauled the ore to head down the hill for processing. 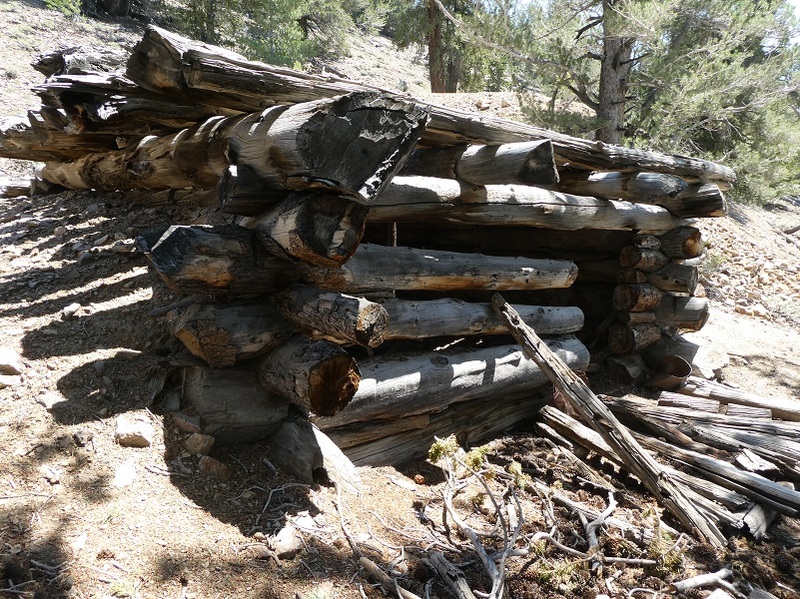 And there were more cabins! I could see how they brought the mined material down through this chute to the landing. 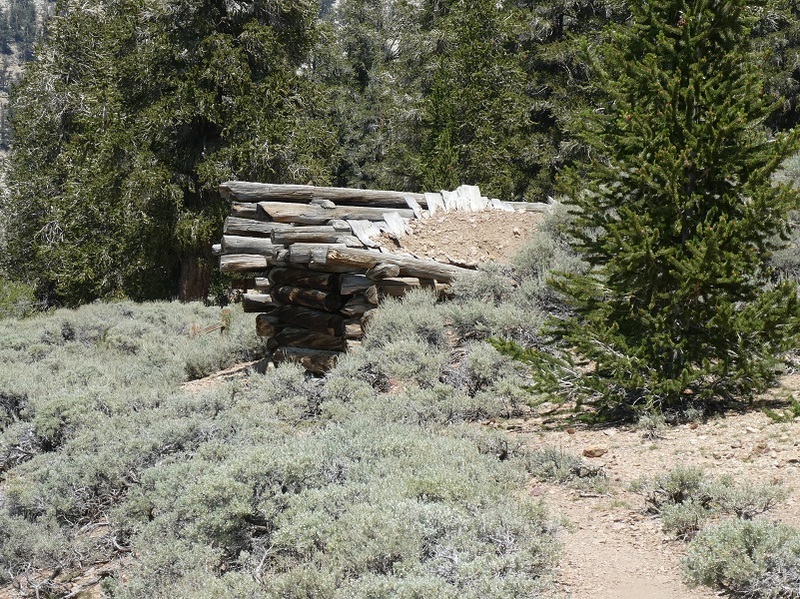 I explored the two cabins near this landing, made of bristlecone and limber pine. 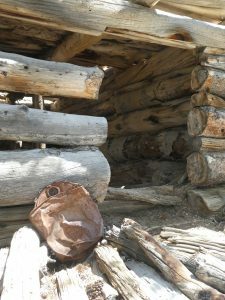 I continued on the old road which turned back into a trail, leading me to the Visitor Center. After thanking Mary for her help and recommendations on the hike, I drove back down our campsite for the night. The Visitor Center was a wonderful place to stop and get my bearings. 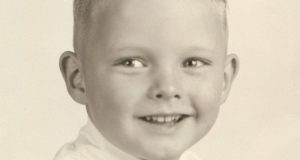 In this blog, I have only scratched the surface of what you will learn if you go there. 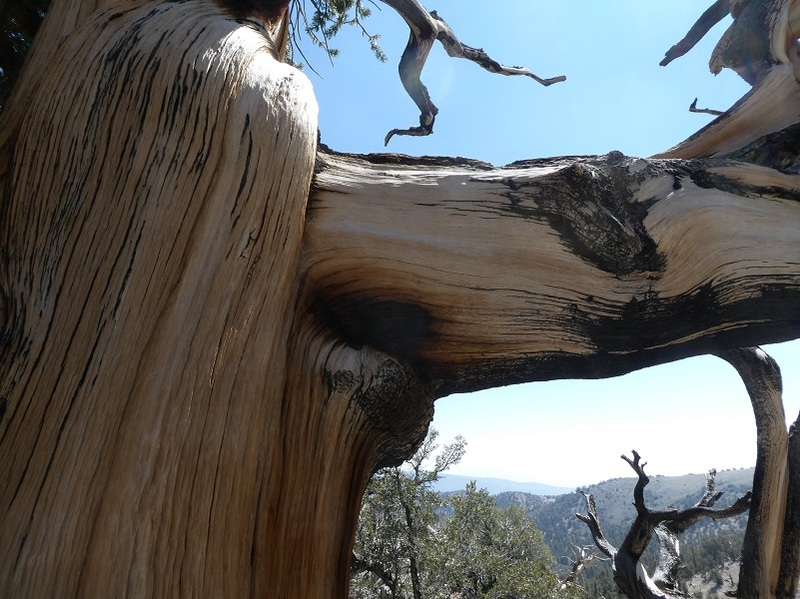 They have an amazing display that shows how scientist have pieced together tree ring samples from these ancient bristlecone pines to put together one long chronology that looks back on climate patterns all of the way back to the end of the last ice age, 11,500 years ago. 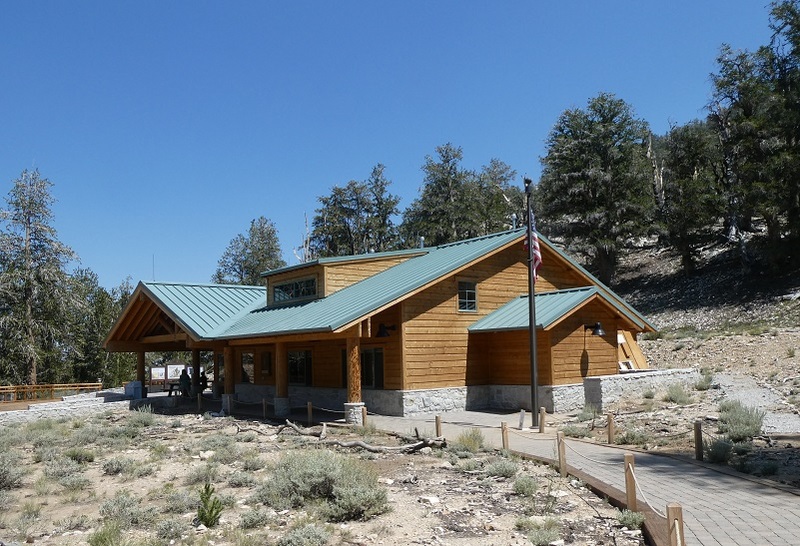 The Eastern Sierra Interpretive Association operates a bookstore at the visitor center, with a large selection of books and maps of the region. 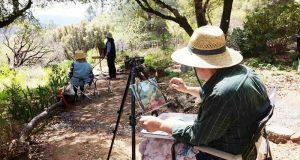 Revenue from sales of these items helps support interpretive programs. 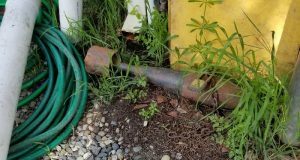 It is very important to understand that there really is no water fountain or spigot available, so plan ahead and bring your own. But if you forget, bottled water is available for sale in the bookstore. 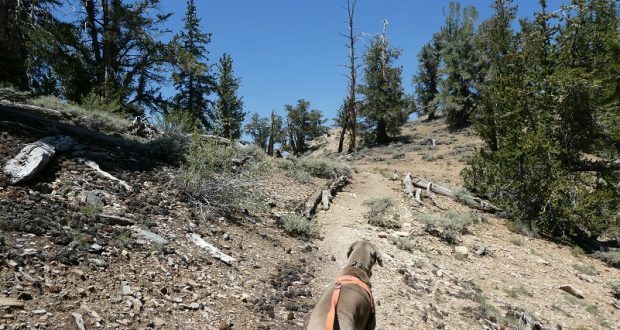 Dogs are allowed on leash on these trails. There are no water sources at the Visitor Center or on these trails, so you will need to pack dog water. I packed 1/2 gallon for Sally on this cooler day and she drank it all.